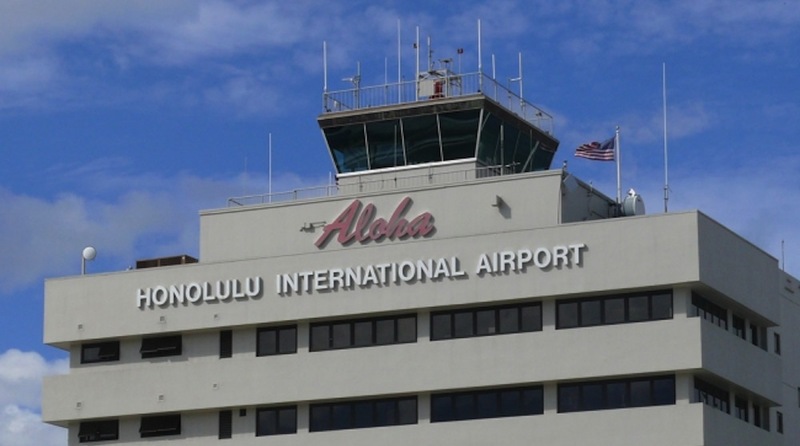 Recently I reviewed from Fred-E.Net / NAPS their Honolulu International airport, which was an interesting experience. 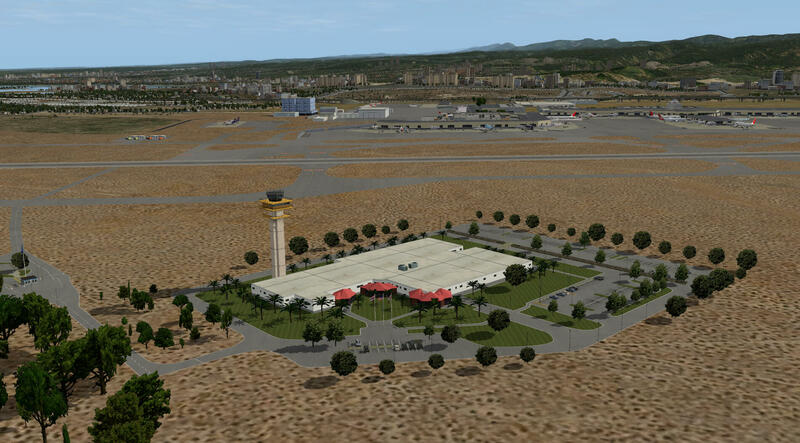 Now it’s time to write a review of the same airport but made by X-plane.Org user “Haui”. According to Haui “This is my version of the Honolulu Intl. Airport (PHNL) on the Island of O’ahu, Hawaii. I’ve been working on this scenery package for about two months and I’m very pleased with the outcome. Even though it’s not completely finished yet, I felt like sharing my progress with the community to enjoy. All in all it’s a pretty accurate depiction of the airport using the Lego-Brick method with focus on the civilian part of the airport. 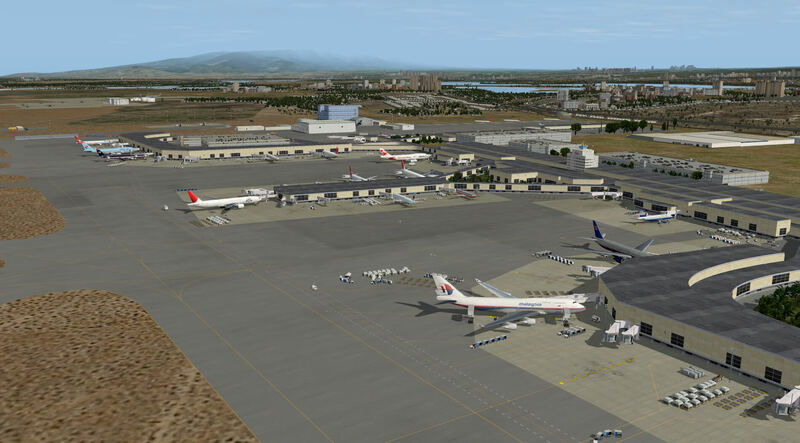 All civilian terminals are modeled (Diamond Head, Central, EWA & Inter Island concourses) as well as the freight apron and the GA area in the South East. 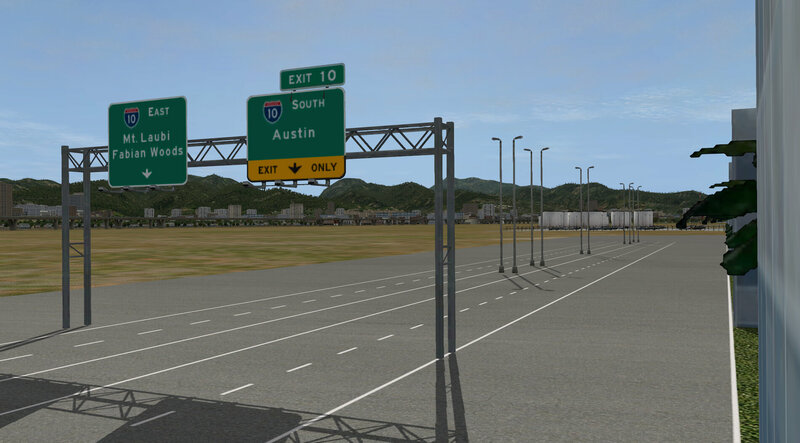 The taxiways are modeled to fit underlying ortho-images like X-Aviation’s RS Enhanced: Island of Oahu or other freeware orthos. Special attention has been paid to taxi/apron markings which contribute nicely to the overall appearance. 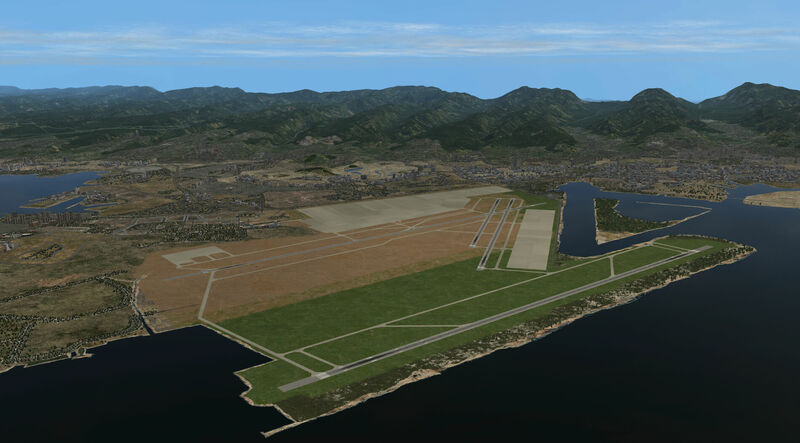 Further on, this scenery should work with X-Plane 9, if you use Chris k’s compatibility library, but I only tested it with XP10.25. It’s not my intention to compare this Honolulu International Airport with that of Fred-E.Net/NAPS version. As far as I could see, no ortho ground layers are added (in this impression of version 1.0 they aren’t, but in his last update version 1.3 ortho material is included) and this makes the package size much smaller. For me I’m curious about what is modeled and how it looks like and therefore there’s no comparison needed. And finally, it’s both freeware thus you can always download them and see for yourself which one you like or just read this review and the other Fred-E.Net review. Based on that, you can make up your mind! 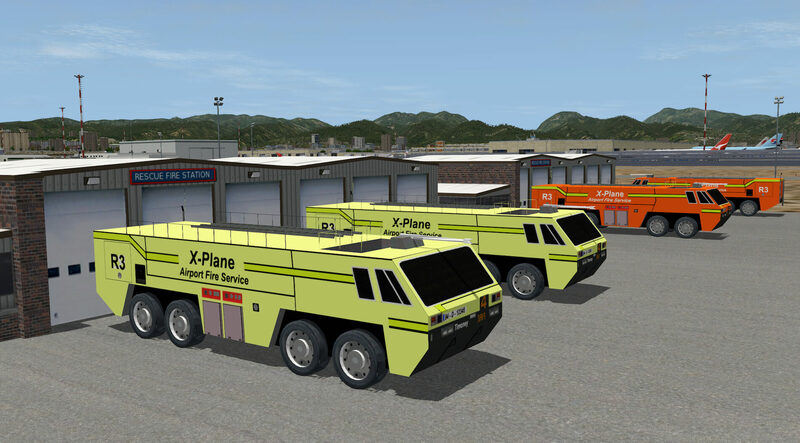 Before I forget it; more information about Haui’s PHNL can be found at the dedicated X-Plane.Org download web page. 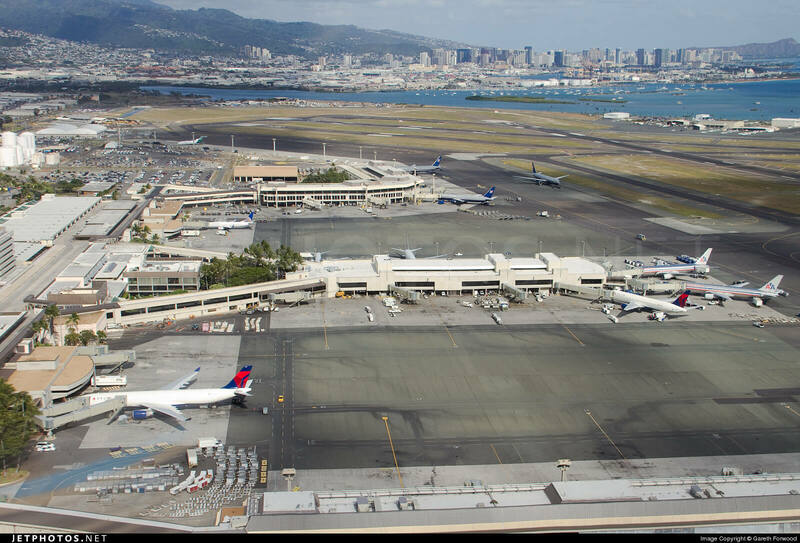 Honolulu International Airport is the principal aviation gateway of the City & County of Honolulu and the State of Hawaii. It’s known as one of the busiest airports in the United States, with traffic now exceeding 21 million passengers a year and rising. It is located in the Honolulu census designated place three miles (5 kilometers) northwest of Oahu’s central business district. Main roads leading to the airport are Nimitz Highway and the Queen Liliuokalani Freeway of Interstate H-1. Honolulu International Airport serves as the principal hub of Hawaiian Airlines, the largest Hawaii-based airline. Hawaiian offers flights between the various airports of the Hawaiian Islands and also serves the continental United States, Australia, New Zealand, American Samoa, Tahiti, Japan, South Korea and Taiwan. It’s host to major United States and International Airlines, with direct flights to American, Asian, and Pacific Rim destinations. It’s also the base for Aloha Air Cargo, which previously offered both passenger and cargo services under the name Aloha Airlines. Hickam Field (formerly Hickam Air Force Base) is a United States Air Force facility, named in honor of aviation pioneer Lieutenant Colonel Horace Meek Hickam. The facility merged with the Navy Base Pearl Harbor to become part of the Joint Base Pearl Harbor-Hickam. 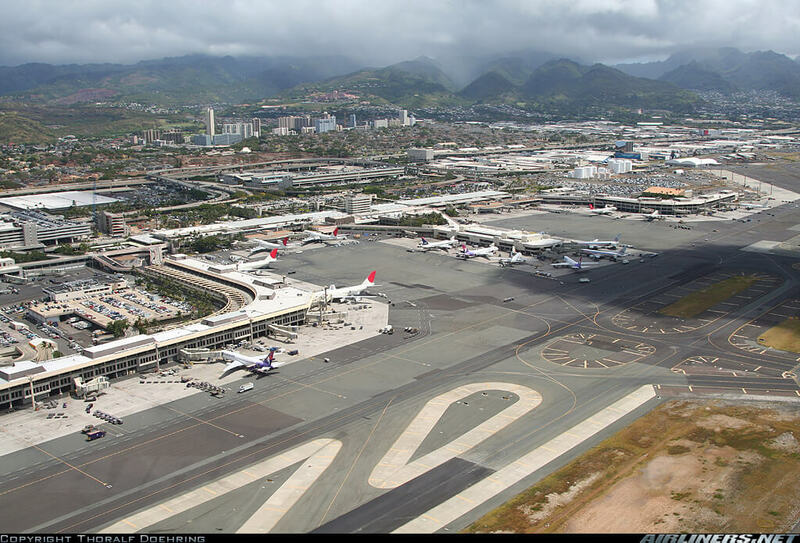 The airfield neighbors Honolulu International Airport and currently shares runways with the airport. More information about Honolulu International Airport can be found at the dedicated Wikipedia web page. Just download via this link the ZIP package, unzip it and copy and paste the complete folder into your Custom Scenery folder. And don’t forget to add these four add-on packages as mentioned in the introduction section. Although the following two screenshots are taken from a large distance, they still show you the changes that are made by “Haui”. 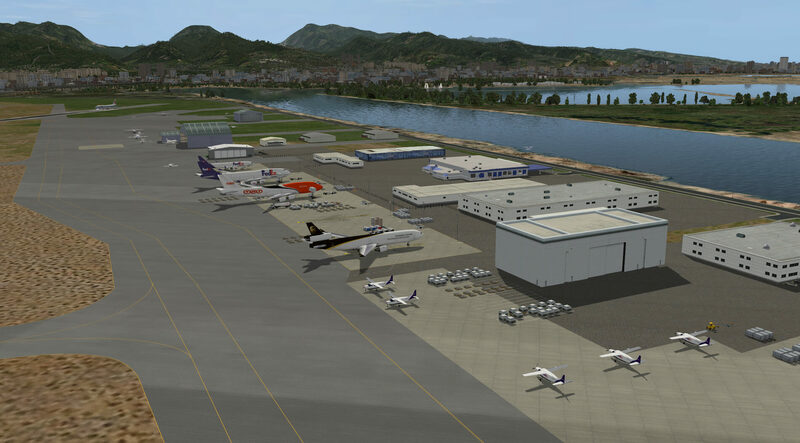 Indeed, the international passenger terminal is created, the belonging apron itself is changed conform the real apron dimensions, the Hickam Field apron is made and some hangars and static aircraft are placed in position. 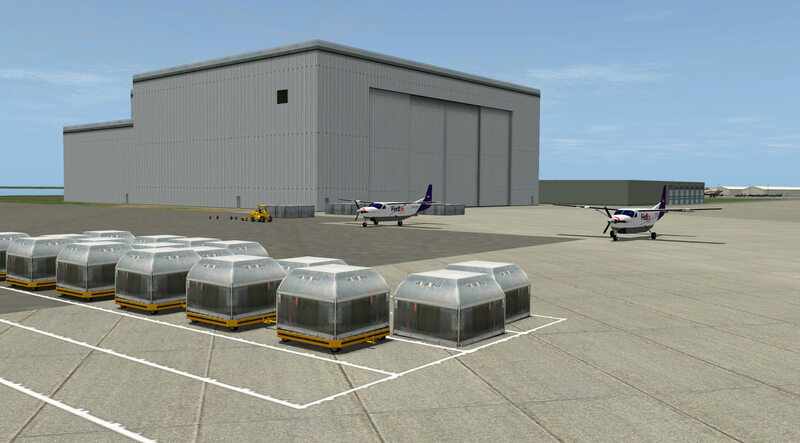 Further on, from the same hover position, the GA (General Aviation) apron and hangers, building etc. are all placed at the right spot. Although from this distance I can’t see how accurate it is, Honolulu is suddenly ”on the map”! 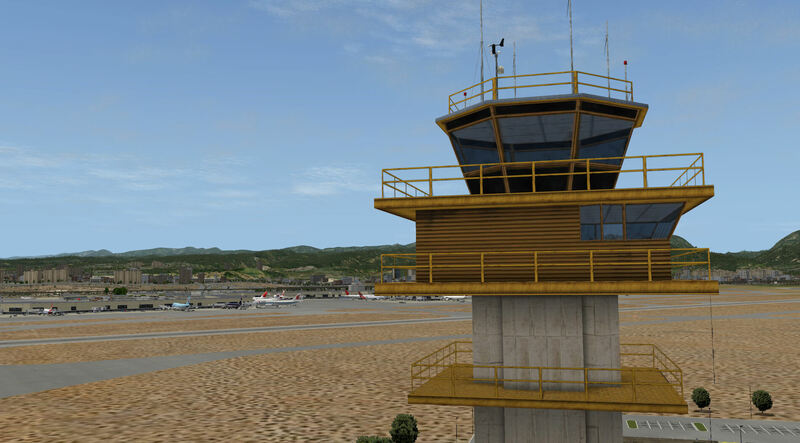 Another interesting item that isn’t forgotten is the control tower, situated halfway along runway 26R/8L. Then there’s also a military area near the coastline, but even more important are the changed look of all the taxiways and tarmac signs. I think it’s time to have a closer look to the passenger terminal, the GA and cargo apron, the control tower and the taxiway signs. On arrival, by car, at Honolulu International Airport, I first need to park my car somewhere in the created car parking houses. And yes, this is outside the airport fence. The car park houses are nicely modeled although being Lego-bricks, it still looks complete. This is the same for the passenger building with the typical control tower/building in the middle. Along the terminal building there’s a road, but this road starts at the beginning and stops at the end of the passenger terminal. Everything else in this area outside the airport fence is just default ground texture without roads. That’s because the underlying ground textures aren’t replaced by ortho-photo material. Perhaps this can or will be added in a later stage to the scenery package. But, I’m pleased that the road in front of the terminal isn’t just a road; it’s more then that. You’ll find road signs, streetlights, cars, buses etc. I think it’s time to have a look to the area inside of the airport fences. 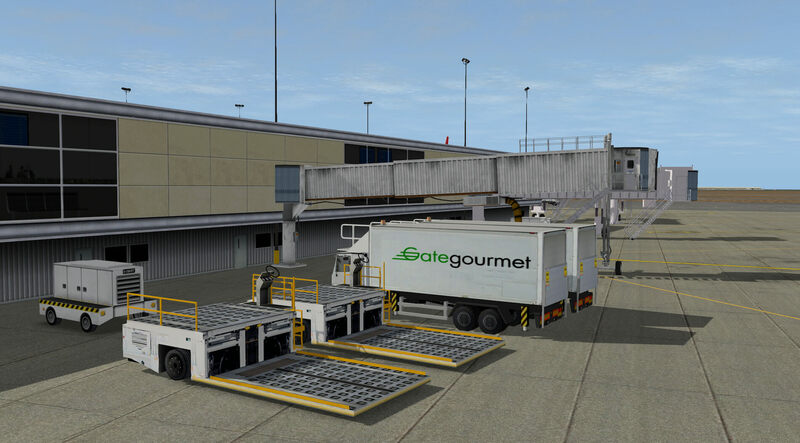 Used lego-brick components or not, the passenger terminal, gates and jetways, and all what’s more there, it gives the aprons a realistic look. When I virtually walk from one end of the terminal to the other end, I’m impressed by the huge amount of static objects integrated in his airport. 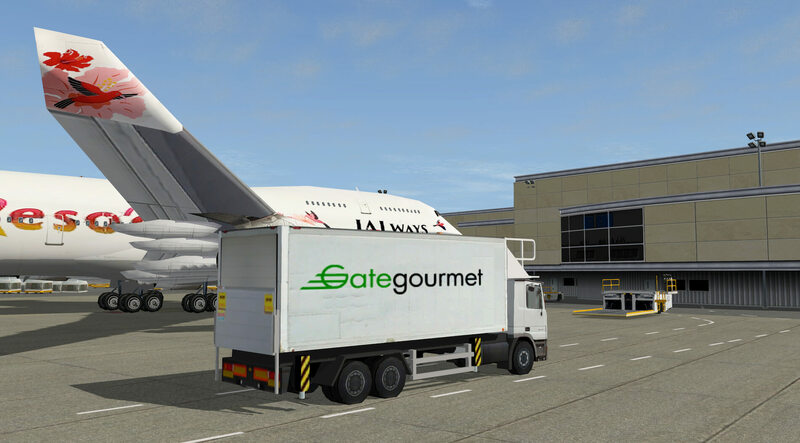 I’ll see truck, pushback trucks, baggage carts, baggage belts, high loaders, catering trucks, passenger buses, containers, container pallets, container trolleys and whatever I’ve forgotten more. 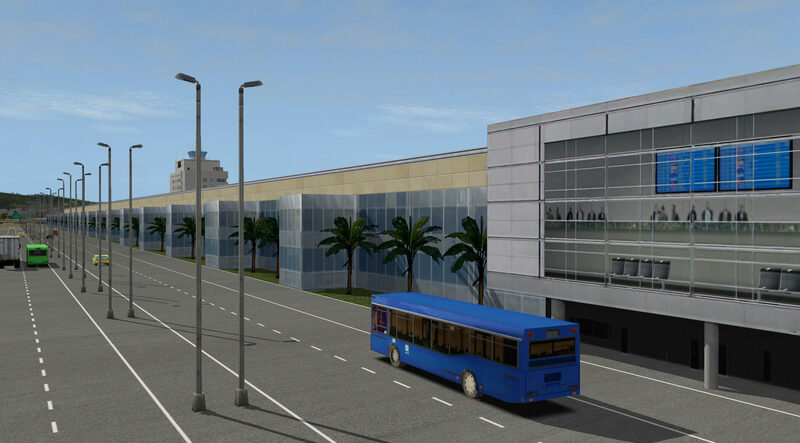 Because of all of this, parked anywhere at the designated areas, it gives the airport a realistic “messy” look, as is always on a real airport too. 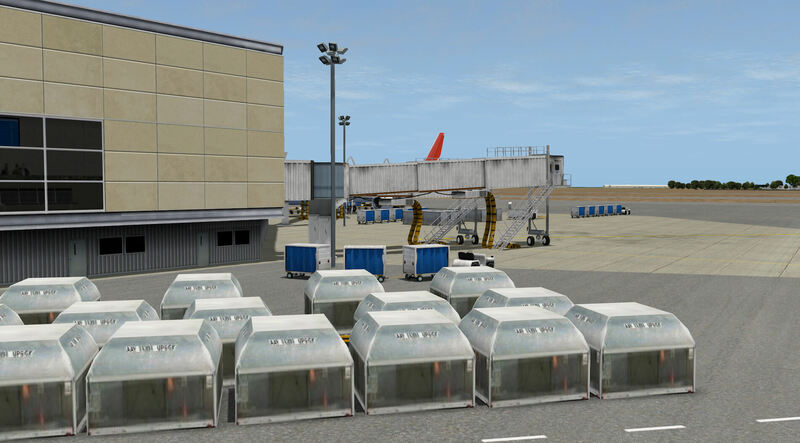 With so many jetways available, it isn’t a problem that you find some static aircraft parked at gates or at standby places. Of course, these static aircraft aren’t of the same quality of my SSG 747-8i Advanced, but from an acceptable distance it looks OK.
During my walk there’s also some time to check the ground paintings and markings on tarmac. I don’t have good real ground photos of Honolulu Airport, but I think it looks good to me. And almost forgotten, the passenger terminal and gates including the roof looks realistic, with sharp textures. And because it’s sharp, it feels so good! 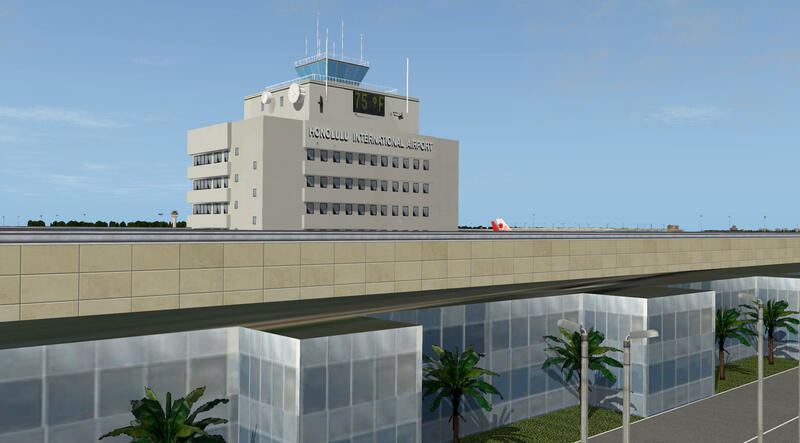 When you try to catch an overview of the modeled airport, and compares that with one of the real photos in the beginning of this review/impression, then you’ll notice that it is made with love! 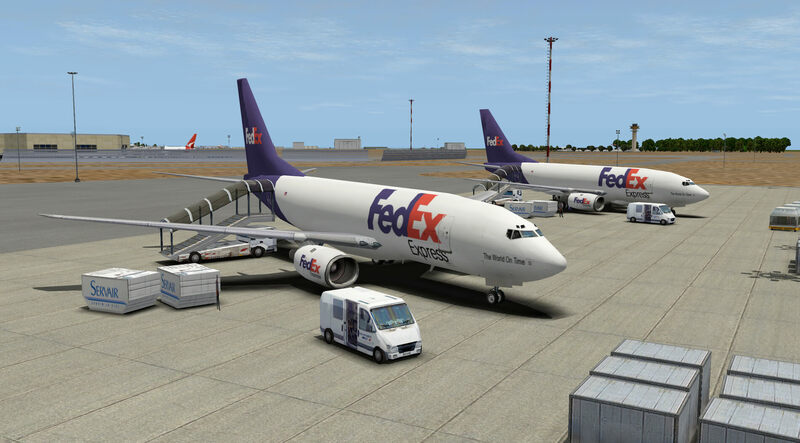 At one end of the terminal is a small cargo area with two parked FedEX Boeing 737’s and of course, lots of ground equipment like containers, trucks, pallet trolleys etc. 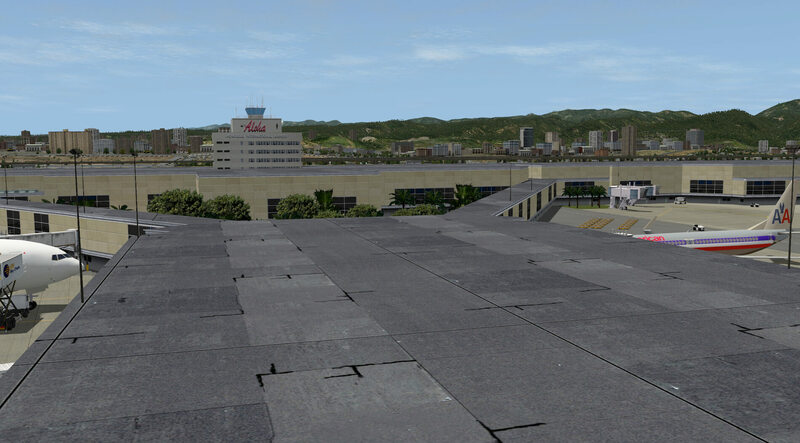 You also find some buildings or cargo terminals, but due to the missing ground textures, some of them aren’t in my humble opinion not really situated, as you would like. Nearby, you’ll find the airport fire department. Since there’s no fire or rehearsal, all fire trucks are parked at their designated position. Also this fire department area isn’t yet completed in my opinion. 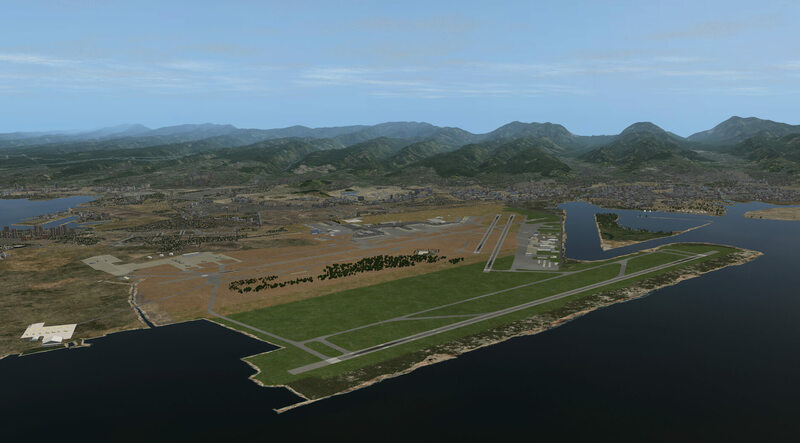 This is mainly because of the use of the default XP10 ground textures. Not a big deal but perhaps, on a day these real ortho photos are added to this package. At the other end of the terminal there’s a parking area for those airliners who don’t need to depart immediately. Some of these parking spots at this apron are occupied by static aircraft, but enough places are free to park your aircraft here. 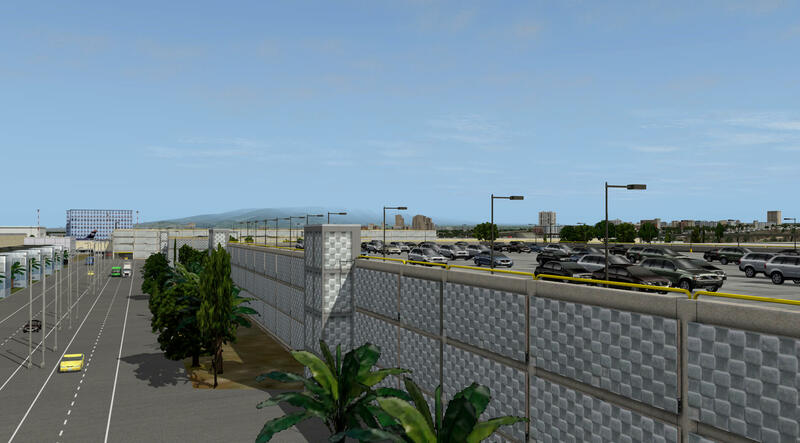 Overall, looking to the passenger terminal and aprons, on the outside and inside of the airport fences, “Haui” did a very nice and created a good-looking replica of the passenger terminal, including the gates and jetways. With the airport authority, I drive via the taxiway Z, W, and C to commuter apron. You’ll find a few hangars here, some buildings and a few static aircraft. Since there’s not so much to see, I continue to the cargo area. 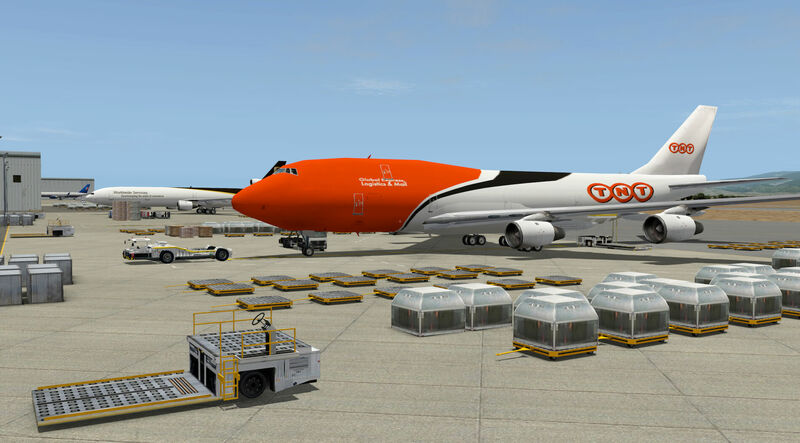 Although the official ground movement map doesn’t tell me that here’s a large cargo facility, only for the general aviation, it looks OK. That’s partly because of the static FedEX Boeing 757, FedEX 747-400, TNT 747-400 and the UPS MD11. 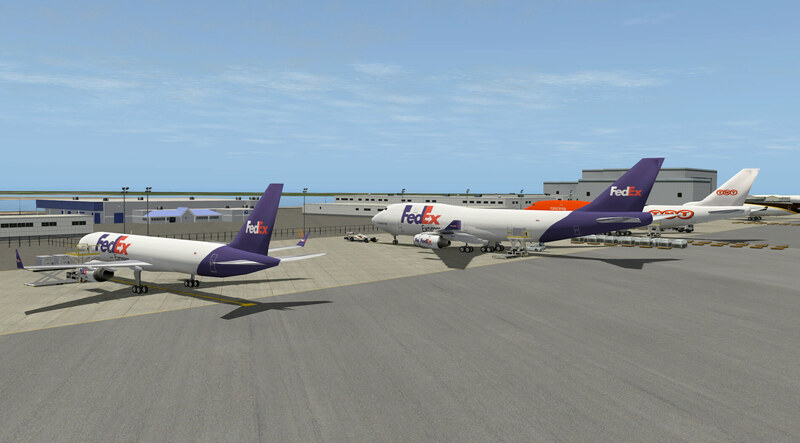 Not sure if all these cargo airliners have these aircraft, but it looks full at the small apron. And again, these aircraft are not standing along at the apron. You find a lot of ground equipment here too like containers, pallet trolleys, trucks, pushback trucks, high loaders and much more. I’m not sure how accurate the hangars are, but the overall apron is filled with many objects and therefore it gives a realistic feeling. 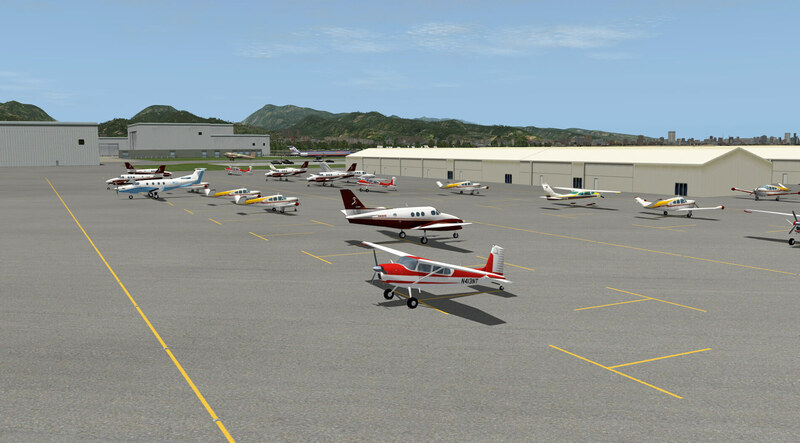 And finally, at the far end of the apron, I reach the general aviation parking locations. It seems there’s no place anymore to park your GA aircraft right here at the designated area, unless you arrive with a large commercial jet. This area may perhaps not be so impressive as the passenger terminal with apron, remember that the default PHNL didn’t had anything. In other words, everything more then nothing is already OK, but I think “Haui” tried to make the best of it. In real this area isn’t much more then buildings, hangars and parking spots for large commercial jets and GA aircraft. The control tower is a part in the scenery what you easily could forget. It’s far away from the passenger terminal, but on the other hand you can’t miss it. Not sure if the tower is close to the real model, the tower with building around it and the many palms situated here too, make it complete. This is, more or less, also the same for the military areas. 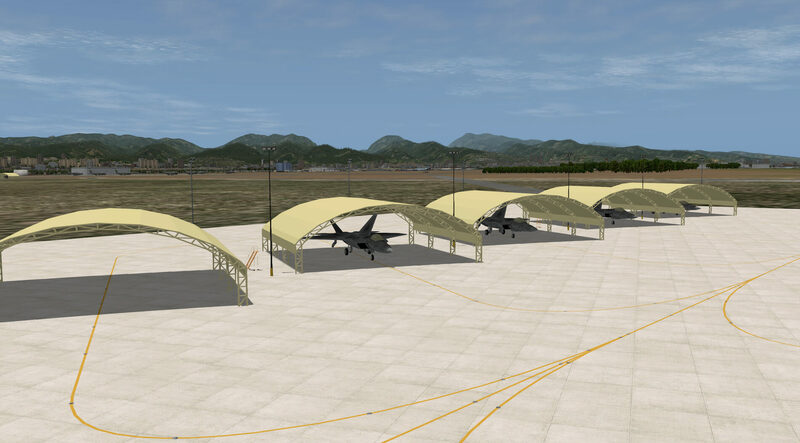 “Haui” mentioned that this will be his next challenge, he created already a Hickam Field apron, totally different then the default apron and he also made a remote military hangar with fighter hangars. Not sure what I mean? Just check the following screenshots and yes, it’s only a small collection of what’s all modeled. First of all, “Haui’s” Honolulu International Airport is free of charge. That means you can always download it and explore yourself. If you don’t like it, which I could hardly believe, you can always delete it from your system. “Haui” wrote at ORG, when time permits, he will try to create Hickam Field, more then what it is now, but I would like to see something else too. And that are underlying ortho photo material for the ground textures. And yes, I could decide to buy something at the X-Aviation store, but for many reasons I don’t do this. Perhaps adding these ortho photos to his airport airport will lift the overall PHNL to great heights. The problem right now is that the passenger terminal and GA area are looking great, but especially the ground textures around runway 26L/8R aren’t real. In this case, yes, I promised it myself not to compare, the Fred-E.Net with all his ground textures in particular in this are, are awesome. Perhaps it’s an idea to contact Freddy De Pues and see if he’s willing to help you with and how to implement PHNL ortho ground textures. The airport is for sure a frame rate friendly design what is good news, especially for those who don’t have high end PC’s/Mac’s. 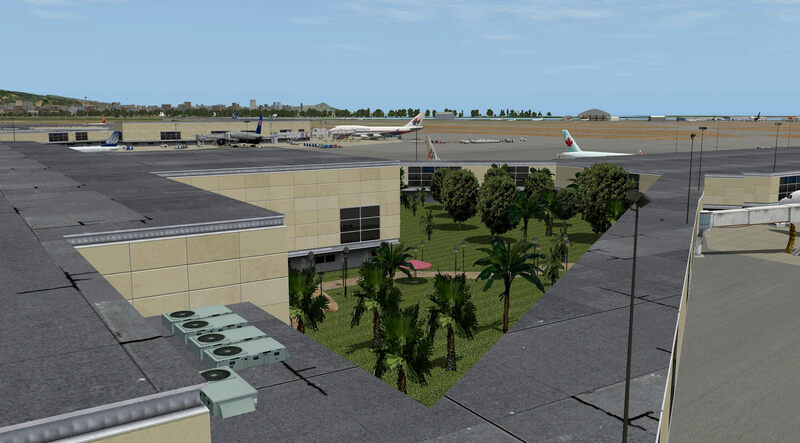 Although there’s a different approach between the Fred-E.Net and “Haui” PHNL, I’m impressed by what “Haui” did and sincerely hope and other simmers with me, if he can slowly improve and extend his Honolulu International Airport version. Since there’s so much to see, I personally would like to add all the screenshots I made in this review/impression, but then this review will be more a slide show and that’s something that I don’t like to do. Therefore, by using the following screenshot link, you’ll have the chance to see all of the leftover screen shots I made. The three “real” photos in this impression are courtesy of Airliners.Net. I hope you like this review/impression and therefore I encourage you to contact me whenever you feel there’s a need for. 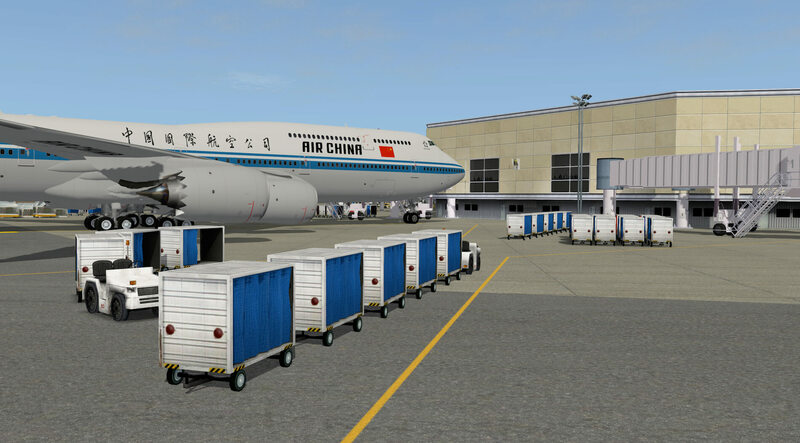 You can reach me via email address Aerosoft.Sim.News@gmail.com or just comment at the review/impression.